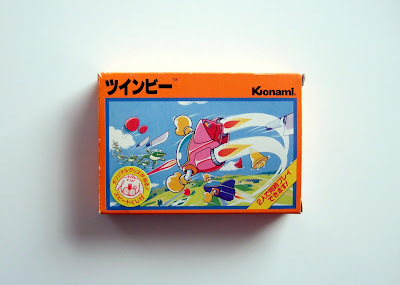 True story: I've never been much of a fan of the first game in Konami's TwinBee series. The PC Engine port of the series' second quarter-muncher, Detana!! TwinBee? Always up for a round or two (or more) of it. And that game's Super Famicom-centric follow-up, Pop'n TwinBee? One of my all-time-favorite shmups. 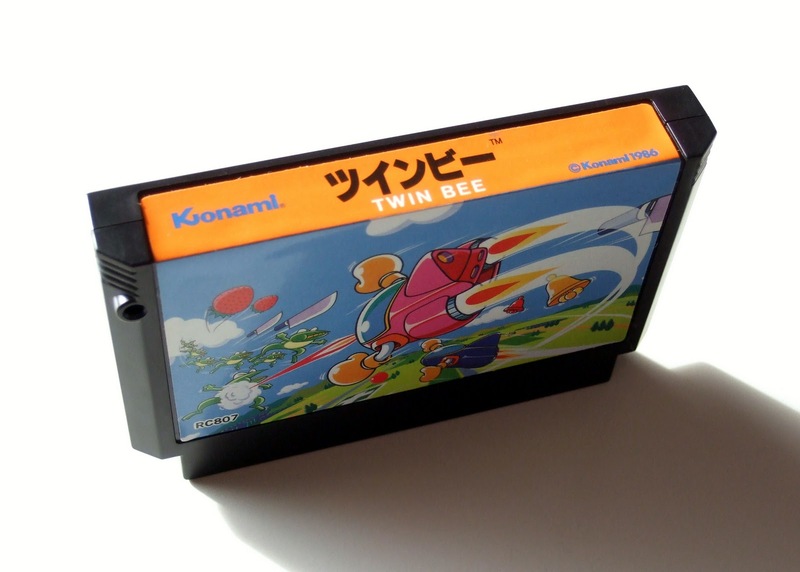 The original TwinBee, though, has never impressed me. Actually, it's generally produced the opposite reaction--thanks to its pedestrian graphics (especially when compared to its above-mentioned counterparts) and its plodding gameplay. So, imagine my surprise when I came across a complete-in-box copy of the Famicom version of this antiquated "cute 'em up" on eBay recently ... and found myself wanting to buy it. Although I wouldn't say TwinBee's packaging is the among the best I've ever come across, it's certainly among the most colorful. Also, it features flying frogs, knives and strawberries--what more can you ask for in a piece of cover art? Anyway, as I'm sure you've figured out by now, I went ahead and bought that complete-in-box copy of TwinBee. It helped that it was fairly cheap, of course, but it's possible (OK, likely) I would have picked it up even if it had cost me a few bucks more. Now all that's left for me to do is put down my computer (and the camera that took the photos above), hook up my trusty Twin Famicom and finally take the game for a spin. I really like the 3D remake for its simplicity. Sort of a "try to beat your high score and not think too hard about it" game. Ah, you have the 3D remake? I've honestly been thinking of getting it, just because I really like the idea of these 3D Classics. I watched the video on the eShop, though, and the 3D is a bit ... extreme. Has it bothered you while playing it, or do you get used to it over time? I could be a commercial. I prefer the arcade version myself (which is included in Konami Arcade Hits for the DS), since the number of times you shoot a bell can be carried over to the next one, meaning that if you shoot the first bell three times, you only need to shoot the next one only once to change colors. 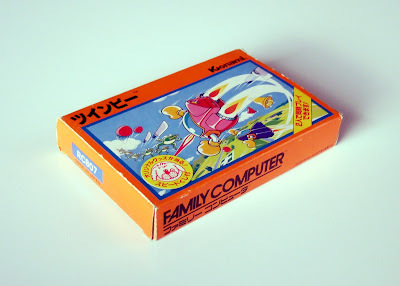 This little feature is absent in the Famicom version, which makes it a bit more difficult to power-up your "bee". Oh, I didn't know that, anonymous! Very interesting. And it does sound like a nice little feature. I wonder why they didn't include it in the Fami version? Anyway, thanks for the info! "I wonder why they didn't include it in the Fami version?" Yes, you're probably right, anon -- esp. considering this was an early Fami release, if I'm not mistaken. Nice find there! I love the cover art on that one too, I have a CIB copy too and its one of my favorite just for the colors (and flying knives of course). I actually kind of like the game too. My wife had it when she was a kid and its one of the games we play together sometimes. Not as much as Dr. Mario or Son Son but its a decent game in multiplayer mode. I love hearing that you play this one with your wife on occasion. Does this game's multiplayer mode have both people play at the same time, or does one play and then the other? I really like Son Son, by the way. Never played it with someone else, though, just by myself.